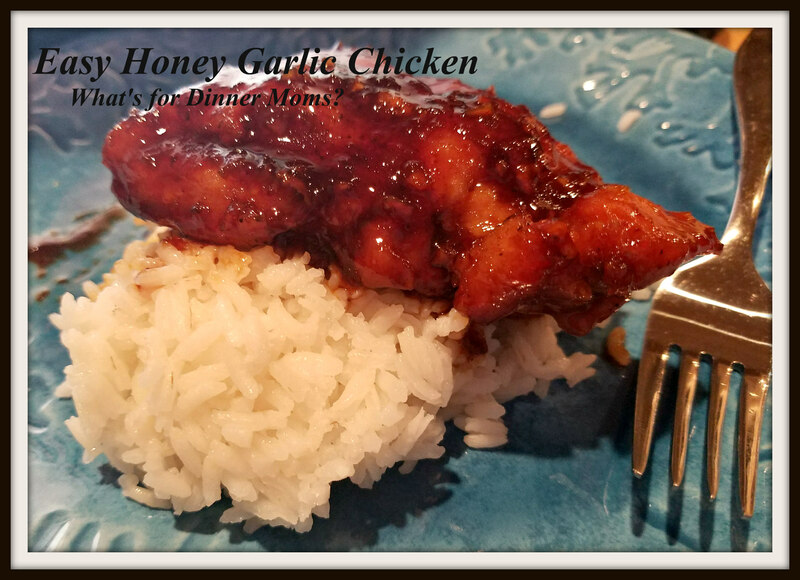 Easy Honey Garlic Chicken – What's for Dinner Moms? I am finally catching up with life. After the little glitch at the Internal Revenue Service (IRS) on Tuesday (tax day in the US) I had a few returns that needed some attention because they wouldn’t transmit electronically. Got them all straightened out in some form and taken care of. So the additional day of work while nice for the pocketbook was not good for the family schedule. Our theme continues to be super simple dinners. I am hoping to get some larger dishes together over the weekend but my house needs to be scoured first. Been a bit too busy lately. 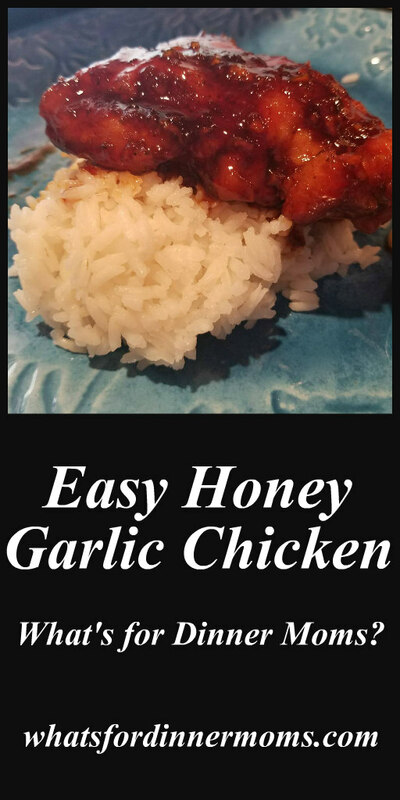 This Easy Honey Garlic Chicken is a perfect weekday meal. You can serve it over white or brown rice and add all the vegetables you want as a side. This was a REALLY simple dish to make. Everyone thought it was really good. We like sauce so I have made this into a “saucier” recipe. If your family doesn’t like as much sauce cut the recipe in half. We served this over rice with a side of steamed vegetables. Cut the chicken breasts in half horizontally to form two pieces. Salt and pepper both sides of the breasts and then dredge in the flour shaking excess off. Melt 5 tablespoons of the butter in a large skillet over medium-high heat. Add chicken to the pan and cook 3-5 minutes until golden brown. Flip chicken and cook until chicken is just about cooked through. Move chicken to the edge of the pan and add garlic to the center of the pan and the remaining two tablespoons of butter. Stir for 1-2 minutes until garlic is very fragrant. Add vinegar, soy sauce, and honey to pan. Stir well and lower heat to medium. Cook sauce stirring well until slightly thickened. Cover chicken with sauce. Serve over rice with vegetables as desired. Thank you! It had a really great flavor too! looks super, love this dish!! Thank You! Lots of skillet dinners,and slow cooker meals for us lately. Slow cooker. I really want to buy one. I think it will be a huge help. I ❤ my slow cooker! Hi. This looks great and looks very easy to make. I too have been using the slow-cooker a lot more as of lately. Thank you! I do love my slow cooker. The sauce on this chicken looks crazy good!